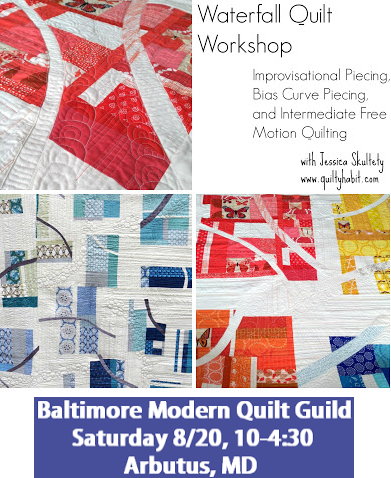 Quilty Habit: Baltimore MQG Workshop - Spots Available! Just a quick note that I'm teaching a quilt workshop in Maryland in less than two weeks (Saturday 8/20), and you're invited! We're packing all kinds of intermediate quilting techniques into one special customized workshop. I absolutely can't wait to see what my students make, and to share the techniques I've been practicing for several years, plus many of my related quilts. Be a part of the inaugural Waterfall Quilt Class! There are a few spots available. Click here to read the additional class details on the Baltimore MQG blog, and you can register right here! Please let me know if you have any questions. Bottom left: Pebble Cascade quilt, bottom right: Emergence quilt. These quilts are original designs by Jessica Skultety. The second half of class, by request, will be an intermediate free motion quilting workshop. Learn how to quilt designs shown above and tips and tricks for quilting modern improvisational quilts. Please note that the improvisation part of the class will be shortened significantly to allow for this.